In a grand webinar style conference on February 8, 2017, over which Judge Anita Brody presided, Co-Lead Class Counsel Christopher Seeger presented an impressive PowerPoint presentation in which he heralded the many benefits of the settlement that was beginning its registration period. He proclaimed the ease of registration and gave hope to thousands of neurologically impaired retired NFL players that after their registration was completed and their claims submitted they would quickly see relief. Those familiar with NFL disability practices and the extreme rate of denials were skeptical, but Seeger assured the class that the NFL had nothing to do with this claims process and that it would not be a repeat of the disability difficulties. We’re now ten months into the claims processing stage of the settlement and the opposite has occurred. The latest figures released on paid claims show of 1,400 submissions, 140 have been approved, and some of these are under appeal. This appears to be consistent with what is commonly believed to be the disability approval ratio, although exact numbers are kept well hidden from public scrutiny. Surprisingly in the settlement, and in an ironic turn, based on numerous court filings the retired players’ primary obstacle appears to be the lawyer who was designated to represent their interest. Many attorneys who actually represent individual class members rather than the class as a whole have filed numerous motions and declarations with the Court seeking relief from the delays deficiencies and denials their clients are facing. Chris Seeger has opposed each and every one. Here I (Blogger) detail his latest opposition brief in a third-person brief-style rebuttal breakdown. Blogger respectfully submits that the motion in reference should be thoughfully reconsidered. While Movants represent individual clients, implementation of the Settlement as represented to the Class and in accordance to its clearly written terms will be of benefit to all claimants and not merely those represented by X1 Law. A reference to appeals anticipates denials. Movant’s petition to the court appears to be an effort to avoid needless denials which will cost any class member who appeals $1,000 fee. Alternately, the NFL in accordance with settlement terms may appeal an unlimited number of claims at no additional cost. The free-wheeling manner in which this was negotiated puts a burden on struggling families with no incentive for the NFL to not appeal claims as desired. Nevertheless it is in accordance with settlement terms. Class Members, as demonstrated through X1 Law’s motion hope to avoid the need to file appeals on denied claims. To coin an old adage, “Actions speak louder than words.” One must ask why Co-Lead Class Counsel opposes every effort to simply and efficiently expedite claims according to the same Settlement he agreed to and was so ordered by the Court. ECF No. 6510 If expedition of the “full and fair adjudication” of claims is indeed the desired result, that result has not been achieved. According to Claims Administrator Orran Brown, it has taken over 70 phone calls to implement a clearly written contract in accordance with the wishes of Co-Lead Class Counsel and NFL Parties. ECF 7827_1. Is that the framework Co-Lead Class Counsel speaks of? Would Co-Lead Class Counsel be so helpful as to produce evidence of this “orderly process?” Adjectives such as “chaotic,” “irrational,” “adversarial” and “confusing,” have been applied to the “process” in communications between this Blogger and numerous Class Members. Perhaps Co-Lead Class Counsel should remove his rose tinted glasses. “Consistent” seems to be the term in controversy. According to the Settlement Agreement, “generally consistent” diagnoses were deemed acceptable for pre-effective date claimants. Upon information and belief additional documentation including but not limited to raw test scores have been added to the criteria since final Settlement approval. According to ECF 8267 “Movants’ Counsel contacted the Claims Administrator in numerous emails and telephone calls to verify the supporting basis for the purported Deficiencies alleged by the Claims Administrator in the Deficiency Notices. The Claims Administrator indicated that ‘generally consistent’ means the same thing as the ‘gold standard’ requirements for diagnoses under the BAP or post-Effective Date Qualifying Diagnoses identified in Settlement Agreement.” Blogger notes that contracts are expected to be executed in accordance with the actual terms and language used in the agreement, not according to terms merely deemed consistent with interpretation of said contract. Would it be reasonable to assume that X1 Law sought to prevent denial of its clients and the lengthy delay and additional cost of likely appeals through requesting clarification and intervention of the Court? A plain reading of the Motion would suggest the affirmative. 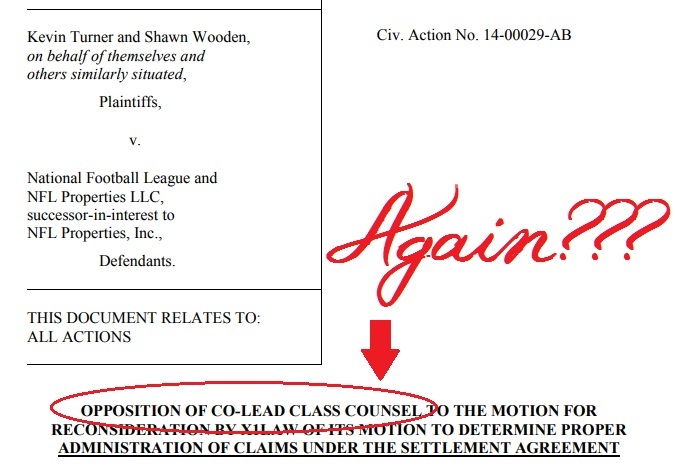 Again, according to the clearly written language of the motion, Movants do not appear to request special treatment, but the opposite; that all Class Members be permitted to follow the processes written into the actual Settlement Agreement and not Co-Lead Class Counsel’s “consistent” revision. Co-Lead Class Counsel says Movants offered “nothing” in support of their motion for reconsideration and then names an article entitled, “Ten months after NFL concussion settlement, most players haven’t seen a dime,” written by respected writer Rick Maese at the Washington Post ECF 8923_2, and an email that adds the new requirement of raw scores for pre-effective date claims. ECF 8923_1. The letter to Your Honor from the “sports blog” was launched because many Class Members who were already concerned about the additional documentation noted in X1’s original Motion (ECF 8267), among other motions and notices of joinder, learned of the newly added raw score requirement late in the afternoon of November 10. Class Members realized that a hearing was scheduled for November 13, and in desperation to reach Judge Brody, because they have lost faith in Co-Lead Class Counsel, Christopher Seeger, composed a letter requesting her intervention. The letter was posted on Blogger’s website in order for Class Members to add their signatures. Despite the letter only posting on Saturday morning (during Veteran’s day weekend) and a strange glitch which corrupted the website’s database and kept it down for half a day on Sunday, more than 100 signatures were gathered by Sunday evening when the signing period had to be closed in order to get the letter to the process server who in turn delivered it to Your Honor prior to the conference. Co-Lead Class Counsel contradicts himself. He acknowledges three new documents yes says “nothing” new is presented. It shouldn’t take a death to qualify for a claim, although according to many widows, even that isn’t a guarantee. Several widows who have spoken to Blogger have stated that even a marriage license, will, and power of attorney are barely convincing Settlement administration of eligibility to file a claim regarding their deceased husbands. The remainder of Co-Lead Class Counsel’s brief delves into the technical legal arguments against granting X1 Law’s motion without further addressing the merits of the brief and real issues described therein. Perhaps this is why NFL Counsel Brad Karp filed joinder with Seeger’s response. Two takeaways from November 13 meeting between Judge Brody, Chris Seeger, NFL Counsel, and Special Masters seem to be apparent. Judge Brody has addressed Class Members’ concerns – to a degree. A promise for more transparent claim statistical reporting and a new set of FAQ’s in which Class Members may submit input have been announced. Disclaimer: Since I often blog about legal topics centered on the NFL, I thought it would be a fun departure to address Mr. Seeger’s motion in the style of a courtroom adversary. Nothing written here is intended to represent legal advice. All referenced documents are linked and the reader is encouraged to read them and come to his or her own conclusion. Neither Sheilla Dingus, nor Advocacy for Fairness in Sports is affiliated with any party in this litigation.